Potty training…. Is there a more dreaded topic? Whether you’re trying to potty train a child at home, preschool, school or center, if you work with a child with autism or other special needs, it’s likely that you’ll be involved with toilet training in some form or fashion. Do you feel overwhelmed? Don’t be. Although it will take work, with the right plan, implemented with discipline and consistency, and lots of patience, you will be successful. Special Learning is very excited to announce our new training series for parents and caregivers. 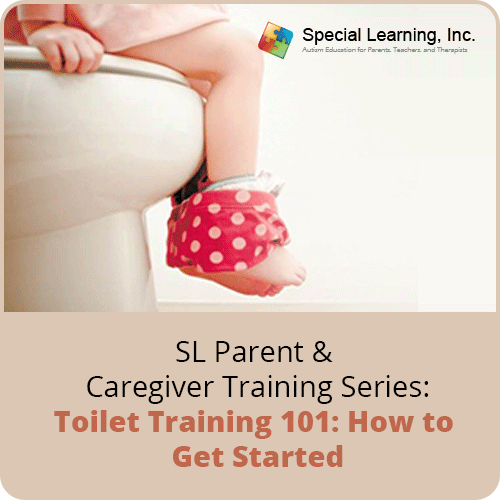 Our Parent and Caregiver Training Series is very different from our other training courses. It was developed for people who need practical solutions to everyday problems but are short on time. We kept the topics practical and short. Using our live webinar format, during the Q&A session, you will get a chance to ask our highly experienced BCBAs questions that matter to you. These trainings are only 60-minutes in length and designed to provide you with practical tips and techniques that you can implement immediately after our training sessions. How to establish a "bathroom routine;"